Daleks are Doctor Who villains. Two were released in the LEGO Ideas set 21304 Doctor Who. 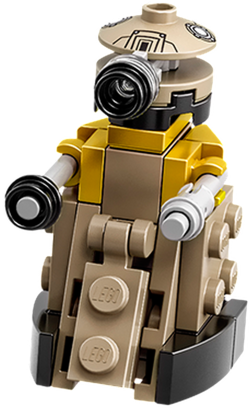 Another version, which can be inserted into LEGO Dimensions as the "vehicle" in Fun Pack, which includes another enemy of The Doctor, a Cyberman, as a minifigure. The Dimensions version of the Dalek can be built into two other models, using instructions unlocked in-game. The Daleks were created by Davros during a war on Skaro, hoping to create a superior being to end the war. The result was a cyborg full of hate. The hate of the Daleks eventually lead to them fighting all across the galaxy to exterminate inferior beings. One such instance was the Last Great Time War, an event that left The Doctor's species, the Time Lords, near extinct. The sheer brutality of the Daleks has made them one of the Doctor's fiercest enemies. This page was last edited on 13 December 2016, at 22:53.